Expansion in Europe continues – Saab Automobile Parts AB establishes new subsidiaries in Germany, France, Switzerland and Denmark. The establishments ensures continued sales and distribution of Saab Genuine replacement parts in Europe. Saab Automobile Parts AB continues to expand in Europe and has established new subsidiaries in Germany, France, Switzerland and Denmark. 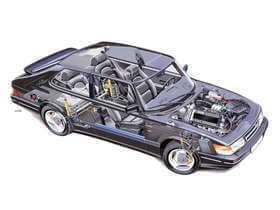 The newly formed companies are wholly owned subsidiaries of Saab Automobile Parts AB and the staff employed have a considerable experience with Saab. The new subsidiaries further strengthen the international representation of Saab Automobile Parts AB. I hope all is well for you. I have some exciting news about our operation that I would like to share with you and the Saabs United community. For awhile now, we have been receiving many requests and inquiries from our Canadian friends to the North, but have not been able to provide parts since we were not equipped to ship outside the United States. We have solved this problem and are happy to announce that we can now fulfill orders to Canada regularly. We are very excited about this new market and look forward to forming many new business relationships. To access their website, just click the image above and check them out. If you remember, Shaw Saab was one of the founding Saab dealers in the US and was in business for 44 years. Fred has stayed committed to the brand by keeping the parts business to service many new and old customers and coming into Canada is just another of the many ways he continues to show that commitment to Saab owners.